Welcome to Intermountain Materials Testing, where we have been assisting property owners, developers, government agencies, design professionals, contractors and suppliers in assuring quality construction since 1997. IMT is a full service geotechnical engineering, special inspection and construction materials testing firm serving clients throughout the Inland Northwest from our offices in the Tri Cities and Spokane, Washington. Our focus on the quality of our staff together with a philosophy emphasizing integrity and excellence in our service are the driving forces that have made us a regional leader in our industry. Every project is a team effort. We pride ourselves on being effective members of that team, contributing to the overall goal of completing a quality construction project on time and within budget. Quality construction matters and IMT can help. Intermountain Materials Testing & Geotechnical is proud to announce the opening of our new office and materials laboratory in Spokane. The facility is located at 9401 E. Appleway Boulevard in Spokane Valley. The new location offers full-scope construction materials testing, special inspections, hma/pcc mix design and geotechnical services throughout Eastern Washington, North Idaho and beyond. We are open for business! Construction of renovations to the building are complete and the materials laboratory is fully equipped and accredited. We have already completed projects for many local agencies and are quickly making a name for ourselves in the Spokane and surrounding areas. Perhaps more exciting for us is the addition of Kyle Sanford to our team. Kyle will serve as a corporate officer and General Manager of our Spokane operations. Kyle is a highly qualified manager, inspector and technician with over two decades of experience in the region. We couldn't be more thrilled with our continued growth and the challenges presented by expanding into new markets. 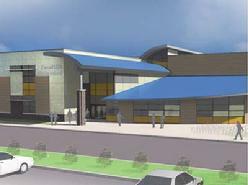 IMT is currently performing required special inspection and testing of earthwork, concrete, structural masonry, structural steel and bolting, structural welding, metal decking and post-installed anchors during construction of the new middle school on an undeveloped site in South Kennewick for the Kennewick School District.